For better or worse, schools are often the places where people learn how to be. For E.M. in particular, school has always been where she has been both most and least comfortable, and her experiences with schooling are what have shaped her most. E.M. attended a number of very different public schools in and around a shifting Washington, D.C. in the 1980s and 90s. Her days as a high school student in particular meant navigating the hallways and classrooms of an enormous public school (over 4,000 students) in urban rim D.C., sometimes feeling like the best version of herself and too often feeling unrecognized, powerless and even unsafe. As a privileged, White, middle class, queer kid of college-educated parents in a very diverse and divided high school, E.M.’s experiences were so different from day to day, hallway to hallway, class to class, activity to activity, that she consciously felt these experiences shaping who she was becoming and how she was learning to interact with various people and institutions. In high school, E.M. learned both explicitly and implicitly about power and privilege, and how to make choices within oppressive systems. E.M. knew even then that she wanted to be involved in this kind of learning and choice-making with high schoolers into the future – and hopefully with more consistent and thoughtful support than she experienced in her own schools. Just as E.M. became who she is by learning to navigate high school, she is a high school Social Studies teacher in order to be a part of young people shaping their worlds, their relationships and their selves in this formative time – whether or not their contexts and/or choices are the same as hers. At City-As-School, E.M. is excited to be a part of a staff of a public school in NYC with 40+ years of providing a supportive, caring and rigorous education that endeavors to teach young people to be the best versions of themselves, through understanding themselves, as well as the people and institutions around them. “We The Students,” is a one-cycle class exploring the U.S. Constitution and Bill of Rights as it does and/or should apply to public schools and public school students. For example, should schools be allowed to randomly drug test all student athletes? Should high school principals be able to censor student newspapers? Do students need to be read their Miranda Rights when being questioned by school officials? The central project in this course is something called “Moot Court,” which is when we’ll argue actual Supreme Court cases related to the First, Fourth or Fifth Amendment rights of young people in front of a panel of outside lawyers and judges, who will serve as Supreme Court “justices.” After “oral argument” each individual will write a paper clarifying and defending a First, Fourth or Fifth Amendment argument related to students, young people and/or schools, which can be expanded for the graduation portfolio. “Stories of Migration” is a one-cycle history class where we’ll not only study the movement of various peoples in the past and today, we’ll learn a framework for thinking critically about migration history and, as philosopher/educator/activist Grace Lee Boggs says, try to tell our own critical migration stories in a way that “advances our evolution as human beings.” The central project in this course will be an interview-based analytical essay. This project will build over the seven weeks of class and will culminate in a seminar discussion and then a 4-page essay. In “What is ‘justice’?,” we’ll use two cycles to consider various human responses to conflict, violence and harm. What do people need — on a personal level and/or on a larger scale — in order to feel that “justice” has been served? What works to bring peace, reconciliation and “justice” after conflict? We will consider and evaluate case studies of conflict and violence around the world and in our own lives, where different forms of “justice” — punishment, exile, prison, service to others, healing practices, storytelling, reparations, restorative circles, etc. — have been used in attempts to bring reconciliation and/or peace. We’ll also learn how to implement some restorative practices for resolving conflict between individuals and small groups in our own lives and relationships. E.M. grew up in Washington, D.C, and Takoma Park, Maryland. She moved to Massachusetts for college, which was a very big, very painful and ultimately very important transition for her. E.M. majored in American Studies at Tufts University, where she travelled inside and outside of the U.S. for the first time, participated in student-led efforts to change the university’s curricular requirements, thought a lot about gender and sexuality, co-taught a course for first-year college students about racial identity, and played competitive intercollegiate soccer and Ultimate Frisbee. In her third year, E.M. took a semester break from college to work at a Haitian immersion middle school in Cambridge, MA, and then returned to Tufts to complete a Master’s in Teaching History for Secondary Schools, while teaching both U.S. and Global History at Somerville High School in Somerville, MA. Prior to City-As-School, E.M. taught several different U.S. History and U.S. Government courses at the Urban Assembly Bronx Academy of Letters in Mott Haven. 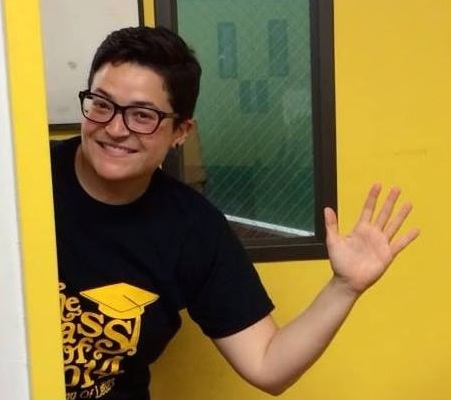 She also co-founded and co-facilitated the school’s “Gay-Straight-Alliance,” and worked as a part-time Restorative Approaches coordinator, the U.F.T. Chapter Leader and an advisor to two spectacular groups of Bronx Letters graduates. In addition to all of the reading she does about and for teaching, E.M.’s favorite books are Caucasia by Danzy Senna, Bitter Fruit by Achmat Dangor, Americanah by Chimamanda Ngozi Adichie, Giovanni’s Room by James Baldwin, and Dogeaters by Jessica Hagedorn. She also reads a lot of vampire books — ask her about The Coldest Girl in Cold Town by Holly Black — and L.G.B.T.Q. young adult books — ask her about Hard Love, by Ellen Wittlinger. E.M. was a super-sleuth crewmember on the D.C.-based, nationally broadcast, science adventure radio program called the Kinetic City Super Crew (KCSC) in the mid 1990s. KCSC was briefly a T.V. show and is now an interactive education website. Read more here.